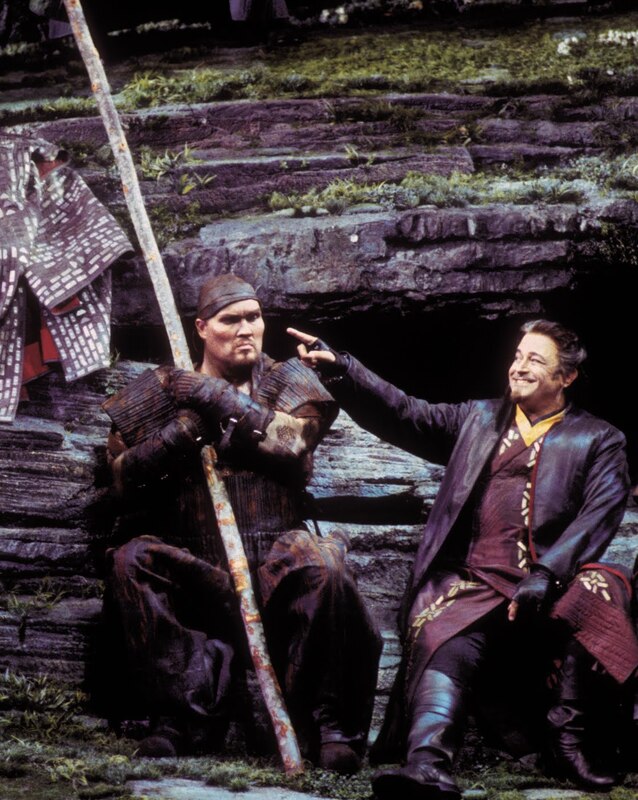 Today we hear from our King Marke, Danish bass Stephen Milling, who won Seattle Opera’s Artist of the Year Award in 2003 for his Gurnemanz in Parsifal. Milling has also sung Fasolt and Hunding at Seattle Opera. Left, Milling as Gurnemanz watches as Chris Ventris's Parsifal baptizes Linda Watson as Kundry, in Robert Israel's 2003 production. Welcome back to Seattle! This is your fifth summer you’ve spent here, singing Wagner for us. Do you have favorite Seattle-area things you like to do in the summer? Yes, with my family we always love to go to Mt. Rainier, my wife, me, and our three sons. Usually we go to Paradise, but this year we went to Sunrise, which we liked very much. And, of course, the big trees, just around the corner [at Grove of the Patriarchs]. There’s a picture of us from 2000, the first time we came to Seattle, standing around this enormous tree, and we took the same photo again this year, ten years later. My youngest son, Theis, was born in June of 2000, while we were rehearsing Die Walküre for the first time, with me [as Hunding] and MJ [Margaret Jane Wray as Sieglinde]; he came to Seattle when he was 13 days old, two weeks after he was born, and he’s here again now and he’s ten. Stephen Milling as Hunding in Seattle Opera's 2005 Ring. In addition to Wagner, you sing Verdi, Mozart, Berlioz...who’s your favorite composer to sing? I love Mozart, but my two favorites are Verdi and Wagner. Those are the real bass roles, my Wagner roles and in Verdi Filippo II [in Don Carlo], Padre Guardiano [in La forza del destino] and so on. But what you really hear in Verdi and Wagner is, they know how to write for every voice, how to match text and music, what vowels work best on top, they know exactly how a bass voice works. And of course they write these big, big dramas, I love that. Marke has been called the most human character in Tristan und Isolde. What, to you, is the most important thing about King Marke? I think Marke sings Wagner’s best-written bass monologue. There isn’t a single note, not a single word which shouldn’t be there. We have here a king, who lost his wife, probably in childbirth, and he’s trying to come back to life; you know, it’s a tough job to be a king, everybody wants you to be strong, so how do you properly grieve when this terrible thing happens to you? And then there’s his enormous love for Tristan, whom he treats like his own son. To be pushed by your own son into marriage, and then to find out that he’s fooling around with your new wife—for a man like Marke, that is the death stab [illustrates with gesture]. 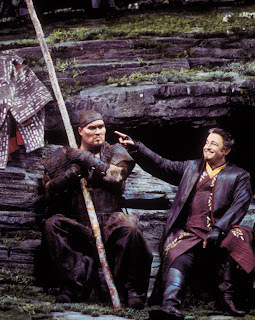 Stephen Milling as Fasolt with Peter Kazaras as Loge in Seattle Opera's 2001 Ring. 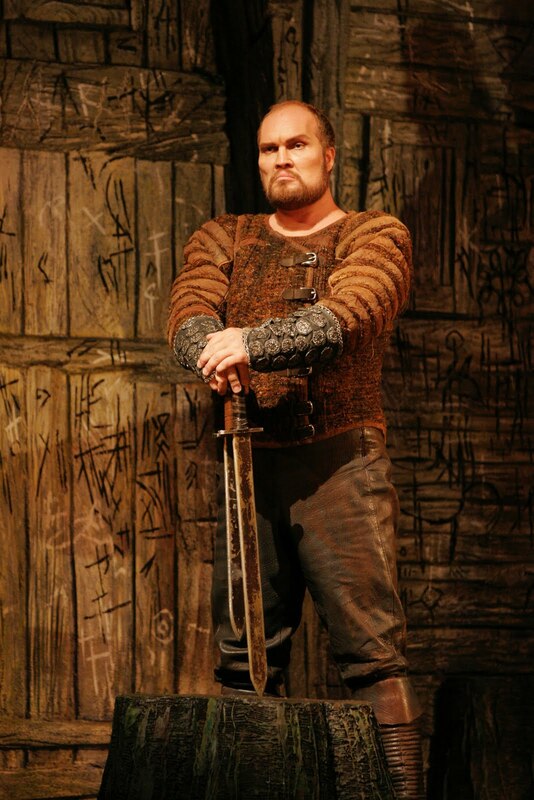 As Fasolt, Freia doesn’t return your affection, and you don’t have any more romantic success with Isolde. Do you ever sing an opera where you get the girl? Or is that a casualty of being a bass? You know, I did a Rheingold, back home in Copenhagen, where I was much more romantic than usual, and Freia was really into it--she understood how much Fasolt adored her. So in the end she was a little sad, because, you know, it turns out it wasn’t about her at all, it’s all about her apples, and she’s taken away from this man who was so devoted to her, who loved her so much. But you’re right, I never get the girls. They always seem to prefer those fat tenors. 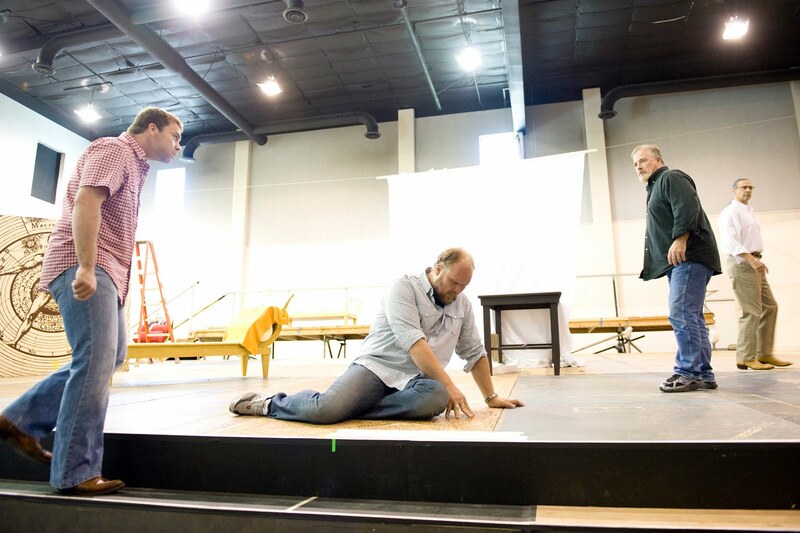 Unlike Gurnemanz, which you did for us in 2003, King Marke doesn’t get much stage time in this opera. Is it better to be onstage all night, like you are in Parsifal, or just to come in, do your scene, and go away, like you do here? I like both. With Marke, you don’t have much time, but it’s so intense! What’s so wonderful about Gurnemanz is the story you have to tell throughout the first act--there’s so many colors, you can take it in so many different directions. I just did a Parsifal in Stuttgart, a very tough and weird production, where the director had me punishing kids with belts and stuff. Sometimes it contradicted the words; but when the performances are over and I’ve digested the whole thing, it gives another dimension to my idea of Gurnemanz, more depth, which I can use later on. In Seattle we’ve often seen you in our straightforward, representational Ring; but you’ve done plenty of regie-theater (in Copenhagen, Hunding as a 1950s military man, or in Valencia, Fafner as a giant metallic puppet). Do you prefer a certain kind of production? Working with Stephen Wadsworth on the Seattle Ring is great; he’s very into the discovering how the characters are connecting to each other, which I like. You can always find a story when you look onstage, whether you look left or right, at this person or that person. I don’t like it when a director doesn’t understand the piece, or doesn’t explain it to the singers so that we know what’s going on. But you have to understand the situation with the sponsors. That affects what happens onstage here; and in Germany, where the opera companies are funded by the government, sometimes it goes a little far to the opposite extreme. When you and Annalena Persson [the Swedish soprano making her US debut in this production as Isolde] speak, what language(s) do you use? I speak to her in Danish and she answers in Swedish. And since nobody else [in the Tristan cast and crew] understands what we’re saying, we talk about everyone, I promise you! Thanks for the interview. I just love listening to Mr. Milling. I saw him in Parsifal and was most impressed with his stage presence. The interview reveals another, very humourous, side of him! Thank you for the interviews. They give such wonderful perspective to the performances via the artists. Yes, the interview with S. Milling IS most interesting!! And I'm happy he does not especially like the werk-untreue productions in German "Regietheater" in which stage directors distort productions simply to show their own "originality" (Gurnemanz running around whipping kids with his belt!! How un-Gurnemanz can one get?? Ugh!!) A very good reason for Wagnerites to come to Seattle, where Wagner is done well!!!! Very well!!!!!!!!! Stephen is great! He's a genius, I believe in it! Thanks a lot for the article, it's really great and informative.